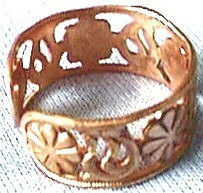 Solid Copper Floral Intaglio Band. 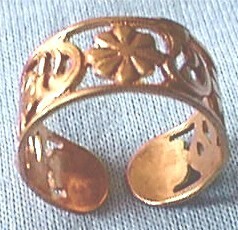 Copper is in Style, It is Also Believed That it Helps in Soothing or Preventing Arthritis Pain. to Fit Any Finger Size. The Band is Appx. 3/8" Wide. It Comes With an Inside Diameter of Appx. 18mm. It Can be Open or Closed to Fit Smaller or Larger Sizes.